Every now and then, when looking at high end watches, one comes across a stellar example of what should be expected only from the house that helped popularize the wristwatch in the first place. Cartier’s Must 21 line does this, and the W1020013 in particular is an open challenge to the world to do better. 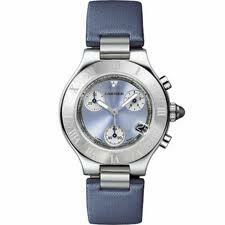 The watch has a fabric strap that features a dazzling moire patters, but in a pleasing subdued blue. The whole thing screams tranquility. The housing is a robust steel with a brushed steel bezel imprinted with the hours imprinted in Roman numerals. They aren’t a high contrast, but by this time in your life, you shouldn’t need numbers to read an analog timepiece. The hands are luminous and sword shaped in proper Cartier time. This watch is about knowing who is boss, you or time. This watch concedes its something of a partnership with daggers. As lovely as the strap and housing are, the face of this watch will pull you into lust unbridled. The face is a polished blue, inset with smaller white dials marked featuring black markings and black sweep hands for use with the chronograph function. You have probably never seen a more attractively laid out chronograph feature on a watch, nor a more attractive watch to feature it. At first blush, the rubber stopper topping the crown seems out of place–but a gemstone would just be uncomfortable and slippery to use when using the chronograph, so the choice moves from a mental curiosity, to a mental folder marked “Things that make perfect Sense”. Hopefully it won’t get too lonely in there. There is a delicious irony to this Chronograph. The irony is that Cartier has crafted a masterpiece of calm and sedate timekeeping–a wristwatch that is unhurried and invites serenity in contemplation of time; then they add a Chronograph function which by its very nature invokes a sense of haste, urgency, and possibly panic. It is a little dose of adrenaline in a sea of calm. A perfect way to keep track of how long you’ve been meditating. There is one thing about this piece that bothers me, and it is a small thing overall. The watch-hands, especially the minute hand, can easily mask the readings of the inner dials at various points in their movement. Precision is pointless if one can’t observe the reading.